What is the area (in cm2) of the trapezoid below? What is the area of trapezoid A? What is the area of trapezoid B? What is the area of trapezoid C? What is the area of trapezoid D? 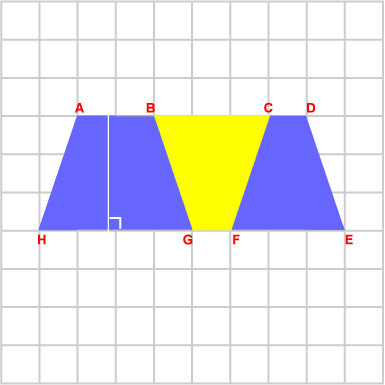 The trapezoids below are on centimetre grid paper. What is the area (in cm2) of trapezoid ABGH? What is the area (in cm2) of trapezoid ADEH? What is the area (in cm2) of trapezoid BCFG? What is the area (in cm2) of parallelogram ACFH? What is the area (in cm2) of parallelogram BDGE?